The roots of Southwestern College can be traced back to 1945 when a group of forward-thinking individuals began a collection of spiritual and metaphysical books to establish the Quimby Memorial Library. In 1963, the library was dedicated in Alamogordo, New Mexico. The collection included the works of Phineas Parkhurst Quimby, the Father of New Thought and an important early influence on American healing and spiritual traditions. By 1976, Southwestern College, then called Quimby College, was ready for dedication. 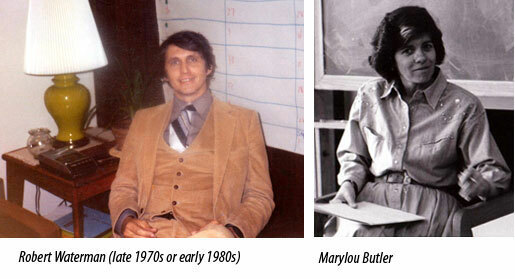 Dr. Neva Del Hunter and Dr. Robert Waterman, the College’s founders, put forth its original mission. The education at the College was to be innovative and holistic. The charge was as follows: the College would teach that the power within a person is as powerful as anything out in the world; that humankind has an inherently sincere desire to learn and a willingness to serve, and that education must encompass the ancient wisdom and knowledge traditions from all eras, including the present one. They expressed high expectations for the students of the College. They firmly believed that education enabled individuals to manifest the destiny of their souls in the world. In 1979 the first classes were offered, with Robert Waterman serving as President. In 1996, Dr. Marylou Butler became the school’s second President and Southwestern College was granted accreditation by the Higher Learning Commission. Later, Southwestern was accredited by the American Art Therapy Association. In 2006, Dr. James Michael Nolan was selected as the third president. Under his leadership the College built the Art Therapy Complex and the Tierra Nueva Counseling Center. During his tenure, the College was also re-accredited by the Higher Learning Commission for the maximum ten years, it launched a much more powerful scholarship program, and recently achieved its highest enrollment ever. On February 1, 2019, Dr. Ann Filemyr was selected as the fourth president of Southwestern College. Since the beginnings of Quimby/Southwestern College, Katherine Ninos has also been a profound contributor to the core curriculum, to the service orientation of the College (as Director of the New Earth Institute and creator of the Transformation and Healing Conference), and to the administrative and financial strength of the institution. Her commitment to the school has been a constant during its long history, and as the current Executive Vice-President, she remains a key, original holder of the mission and vision of Quimby/Southwestern College. Today, Southwestern College continues to teach in a holistic, transformational and experiential way. Students are challenged to acquire knowledge and skills in the context of a rigorous applied curriculum. They learn to cultivate the qualities of transformational leadership so they can assist others to realize their full potential. They graduate from the College with the skills necessary to foster transformation in themselves and in others. Our graduates, faculty and board members are some of the most prominent professionals in the world of mental health in New Mexico today. For more information on the history of SWC check out the Heartlink Newsletter back issues.